The explosion, the sudden, awful deaths, the painting and the ring are the mechanisms that set this big, complex novel in motion. It is a testament to Ms Tartt’s Dickensian skill that she is able to make this extraordinary situation, and every one that follows, feel both true and lived. Ms Tartt gained immediate renown when her first book, “The Secret History”, came out in 1992. Readers had to wait a decade for her second, “The Little Friend”, a southern-Gothic-style tale, that some found disappointing. “The Goldfinch” has taken another 11 years, but the wait has been worth it. The book’s driver is Theo, and, like “The Secret History”, it is written in the first person. After the bomb he is taken in by the family of a school-friend, Andy. Theo, whose mother could not really afford his private schooling, never quite settles into Andy’s privileged, Park Avenue life. Before too long, he heads downtown in search of Hobart and Blackwell, and there a door opens onto a new stage. A line might be drawn from other youthful American narrators—Huck Finn, Holden Caulfield and Scout Finch—straight through to Theo Decker. Like those characters, he is nearly always just outside every situation he finds himself in. It makes him a subtle mouthpiece for Ms Tartt’s acute observations about the lives her protagonist finds himself leading. Theo is buffeted by his childlike inability to discern what it is in life he might really want and his fear that, without his mother, he will be entirely lost. Things hardly improve when his feckless father reappears on the scene, lifting him away from Park Avenue to a dissolute Las Vegas. Ms Tartt’s language is heightened yet confiding, whether she is describing the cloying social workers who threaten to place Theo in a crisis home for “youth in need”, Andy’s mother slipping him sleeping pills to shut off his nightmares or the burned-out edges of Las Vegas that are so far removed from its brilliant neon core. It is in Vegas that Theo meets Boris, the sidekick every good hero needs and one of the book’s most appealing creations. Despite his charm, Boris has a darkness about him that draws in his new friend. Theo likes to think of himself as a good kid, but is he? He was at the museum with his mother only because he had been suspended from school for smoking; the seeds of his own corruption were always in him. And it is that corruption that takes the novel, in its last quarter, into the territory of a thriller, car chases and guns included. Behind every aspect of Theo’s life is the painting; a terrible asset, a fearful and shimmering secret. “Beauty alters the grain of reality,” one character remarks. Fabritius’s picture haunts Theo even when it is shrouded in a warehouse. Late in the novel, when Theo comes into contact with it again, he runs his fingers incredulously along the frame, “like Doubting Thomas across the palm of Christ”. 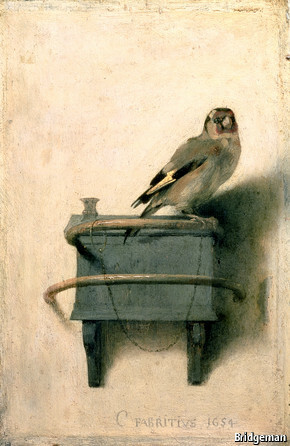 The final section of the book takes as its epigraph a quote from Nietzsche: “We have art in order not to die from the truth.” At the beginning of this novel Theo’s existence, as he knows it, is destroyed; Fabritius’s little goldfinch, chained to its perch, is an unlikely saviour. “The Goldfinch” is a startling accomplishment, bringing a truly Victorian tale (complete with an orphan’s moral education and the secrets of a heavy gold ring) right up against the explosive device of a postmodern thriller. But Ms Tartt has the true storyteller’s gift, what southerners call “yarning”: the voice she creates is so convincing that the reader will believe anything she says. It would be wrong to see this as old-fashioned. Just when it seemed that television was becoming the only medium in which to tell a big, wild, daring tale, Donna Tartt reminds readers that the best novels can still do this too.